I had a moment like that, just as I began writing this. I was sitting at my computer attempting to rescue a particularly dull couple pages of marketing copy for a client of mine, when I glanced at the plate of three manchego-stuffed shishito peppers — one eaten — sitting beside me. I’d been inspired to make them to snack on while I worked by a nearly exhausted rind of manchego cheese I’d discovered in the cheese drawer a few minutes before. Now, resting there on the desk beside me, the peppers picked up the muted light of a stormy sky outside. The greens and charred browns of the peppers, the ochre of the burnt cheese bubbling from within, were particularly sublime. And resting on top was a perfect pyramid crystal of Maldon salt that might’ve held within it the secrets of the universe. Soon I was in a contemplative place far from the high-performance battery I was supposed to be writing about. And I began to write about beauty instead. There are many places to find the muted, indescribable beauty of the world — as many in fact as you are willing to look. Though most often, it sneaks up and finds you in the most unexpected of places — like the dancing bag from the movie. A telephone rings, I am stirred from my reverie — and reminded that the high-performance battery copy I’m supposed to be focused on will buy more time and freedom to experience more of the moments of indescribable beauty that the world has to offer. And confident that the future will hold infinite such instances if I am only in the place to receive them, I return to the task at hand. thanks…..beautiful as usual…stressful times here for us…. I’m reminded of a poem in which the phrase ‘if bees are few’ then something else will do. If bags floating on the breeze are few look at your children’s eyes. I will find the poem. That snack looks divine. I love shishito peppers though I’ve never had them stuffed with cheese — going to have to remedy that very soon. Love this post — great imagery! I am also fairly confident that if anything holds the secrets to the universe, it is most definitely Maldon salt. 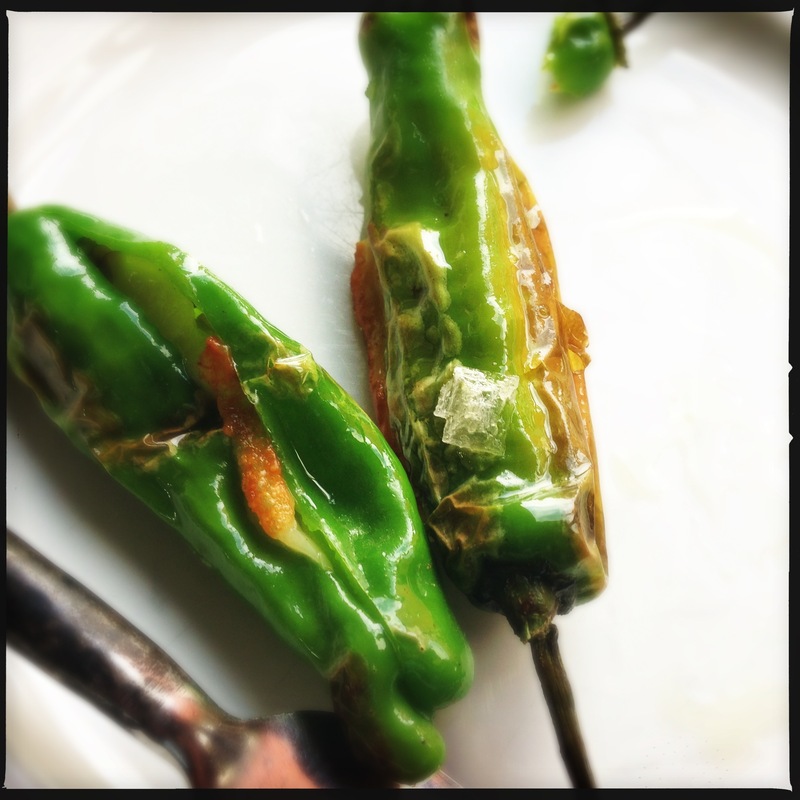 Shishitos stuffed with cheese is basically just a riff on padrons stuffed with cheese, which is a fairly standard tapa.